In our research we found it difficult to separate the many events involving hundreds of birds falling dead out of the skies from the fish floating up dead in the waters of the world. That is because a lot of them happened during that same mysterious week between December 10, 1010 and January 4, 2011. The death of all the birds and fish appeared to in some way have been caused by an outside force that affected them at the same time all over the world. But like the fish kills the bird falls have continued in large numbers ever since. They just aren’t all doing this at the same time. Nor are they occurring in the same places. 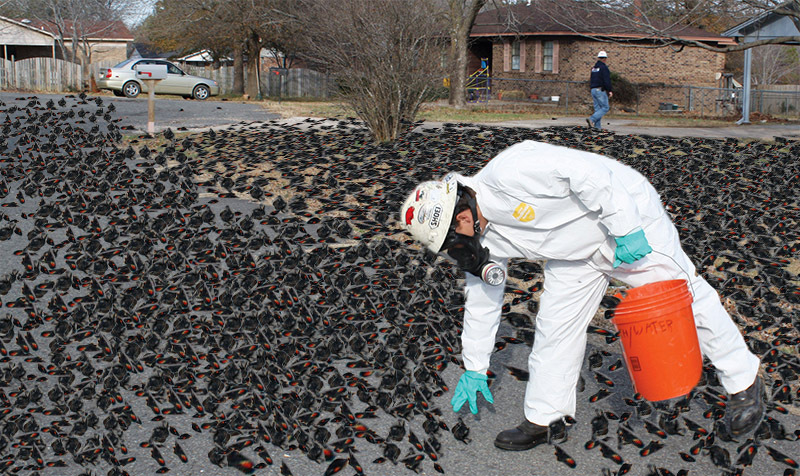 At the little town of Beebe, Arkansas, an estimated 5,000 redwing blackbirds and starlings were found lying dead in about one square mile area on New Year’s Day, 2011. The state wildlife service speculated that a fireworks display the night before frightened the birds from their roosts, sent them flying wildly off into the darkness, where they killed themselves flying into trees, electric lines, houses and other objects. Another flock of about 200 blackbirds were found dead at Beebe on New Year’s Day, 2012. The Arkansas Game and Fish Commission investigated the learned that tricksters exploded fireworks in the same area, thus causing a repeat kill. That was the official explanation. But why did tens of thousands of dead fish wash up along the Arkansas River, only a few miles away from Beebe, on about the same day? The commissioners never could explain that. Fireworks displays did not appear to play a part in many of the other mass bird kills that also occurred that week around the world. On January 3, another 500 red-winged blackbirds and starlings were found dead at Pointe Coupee Parish, Louisiana. In Faenza, Italy, thousands of turtle doves fell dead from the sky on January 5, 2011. About 100 jackdaws fell dead that same day in Falkoping, Sweden. And on January 5 people in Constanta, Romania, told of watching starlings falling "like stones" from the sky. --Thousands of loons, ducks and seagulls washed ashore at Wasaga Beach, Ontario, Canada, on October 22, 2011. Researchers blamed a botulism outbreak. --In Utah, an estimated 1,500 grebes took night-time death dives into a Walmart parking lot, football field and area streets on December 12, 2011. --The Peruvian Maritime Institute investigated the strange deaths of over 500 pelicans and 54 boobies found on a 40-mile stretch of Peru’s northern Pacific coast in April, 2012. Researchers said the birds appeared to have died on shore and did not wash up on the beach. The dead birds were found in the same area where about 800 dead dolphins washed ashore earlier this year. --In March, 2015, an estimated 2,000 snow geese fell from the sky over Eastern Idaho while on a migratory flight north. State Fish and Game experts said the birds appeared to have died from avian cholera, possibly from something they fed on during the flight toward seasonal breeding grounds in Alaska. Later in June that same year, another mass bird fall of various other breeds of birds occurred at Kuna, Idaho. The cause left state researchers perplexed. --Another great mystery has been the deaths of thousands of auklets and other coastal seabirds that have been washing ashore along the Pacific coast from California north to British Columbia. The Coastal Observation and Seabird Survey Team says it is the worst kill-off of coastal fowl seen in over 20 years. The numbers are estimated at between 50,000 and 100,000, and the dead birds are still washing ashore. Wildlife researchers have been quick to blame the massive die offs on severe weather, disease outbreaks, pollution, climate change and even poisonings. Some conspiracy theorists suggested the military’s HAARP technology was involved. Others are connecting the radioactive fallout from the Fukushima disaster in 2011. Cleveland meteorologist Mark Johnson began researching the bird kills and especially zeroed in on the events over Beebe, Arkansas, on New Year’s weekend, 2010-2011. Johnson said he found "logical explanations" for most of the bird kills, but the events at Beebe mystified him. "Fireworks go off all the time. This doesn’t normally cause hundreds of thousands of birds to leave their roosts in a frenzy and then fall to their deaths." In his research, Johnson studied the Doppler radar images at Beebe at the time of the event. He noted that the flying birds are easily seen on the imagery, but nothing more. When he examined three dimensional images of the atmosphere over Beebe that night, he said he found something he could not explain. It was what he called "a huge plume of turbulence over the Beebe birds just as they began their flight." Johnson said he ruled out a sonic boom, meteor shower, or other odd aerial events. But he said "something in the atmosphere, something mysterious, occurred over Beebe Arkansas that night." When Johnson reported his discovery on his Cleveland television news station, it caught the attention of National Geographic Explorer producer James Donald, who was also investigating the strange bird and fish kills. He interviewed Johnson and produced a special report as a National Geographic television production. The National Weather Service then got involved, as did researchers for the Massachusetts Institute of Technology Lincoln Laboratory. Donald recalled that "we had all of these scientists standing around a radar screen just shaking their heads. Even these guys couldn’t explain it." But the research team had to come up with some kind of explanation, as all research teams do, and this was what they came up with: It was a combination of events centered around a temperature "inversion" that acted like a megaphone, amplifying the noises of the fireworks. This frightened the birds so they flew wildly into each other, into trees and buildings before dropping dead on the ground. We think they took the easy way out. That strange image on the radar screen has not really been explained. If not HAARP could it not have been a top secret experiment involving an even new military weapon system? Then there is another factor that nobody has mentioned in the stories about the mass killings of the birds. Birds feed on seeds. Could it be that these entire flocks of birds are finding their way into storage buildings containing Monsanto’s toxic genetically modified seeds laced with toxins designed to kill insects and weeds on the farm? What would these seeds to the birds? The USGS National Wildlife Health Center in the United States reports as many as 175 mass death events exceeding 1,000 birds at a time happening over the past 10 years. It is interesting to note that Monsanto began genetically modifying plant cells in 1982. Yes Mr. Sprat, the mass bird kills are a serious concern. These events appear to be directly linked to human activities that are either poisoning or polluting the environment of the birds and sealife.